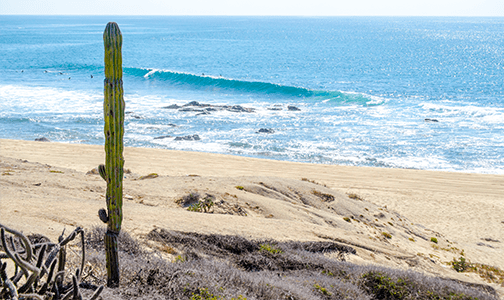 Immersed in the bowels of La Baja desert Nine Palms is a Mexican jewel, a true oasis of surf in Cabo. From March to October (Spring/Summer) the swells coming from the south bring with them fun surfing sessions at this point break, a good option if the day is not windy. The popularity of this spot has grown slowly due to more accesible roads being constructed but remains friendly and accesible regarding locals welcoming tourists to surf its waves. The wave is a rocky bottom one from 3 to 10-feet high that breaks to the right and consists of 2 sections; the first section (where the wave starts) gives local and international surfers a friendly water ramp with a very simple drop for a long distance, enjoyable by surfers of every level with any kind of surfboard. The second section comes across a rock coming out of the bottom, when there is low tide you will be able to see the rock and position yourself to the right of it and catch the water ramp of this section, it has less height than the first one but equally fun and long. 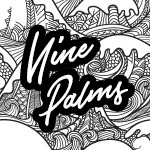 It’s recommended to use long sleeve rash guard and lots of sunscreen due to the high temperatures of the desert (in hot seasons) that may get more than one surfer sunburned. In the last couple of years this wave has become one of the most loved in the East Cape zone, easy access to it has contributed to that popularity but specially its consistency throughout the hot seasons (Spring and Summer). In a good day, coming from the dirt road towards the East Cape there is a bay where you can see from above, these offshore right waves breaking perfectly in the blue water, a wicked thing that will thrill you before surfing this point break. As most of the desert surf spots the wave is very soling and runs for a long distance on top of a rocky bottom (reef), being a little faster water ramp that breaks to the right giving surfers the steadiness required for a fun surfing session that can be achieved by almost any surfer and any surfboard. Unlike most of the surf spots around the area, this wave is special because it works well in windy conditions, so it’s a good choice when air steams come from the Sea of Cortés with out previous notice. 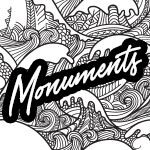 Monuments is a very recognized wave that possesses a touch of glamour due to its proximity to an exclusive zone of Medano beach, one of the most popular beaches in Cabo San Lucas. if you want to stay within paddling distance of this wave you can stay at The Cape Hotel which is right in front of this famous surf spot. 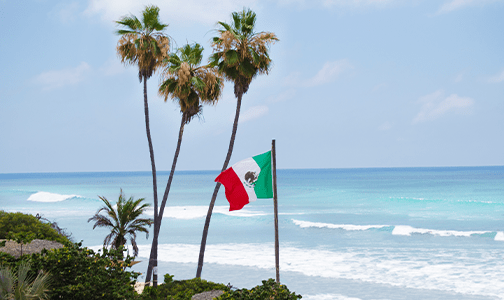 Surfing this wave and getting your picture taken will make it extra special with the Arch of San Lucas behind you, a true postcard from your surf trip. Los Cabos zone is full with right waves, this one is one of the few lefts that exists in the Cortez sea side but it’s not the only thing that makes it special. 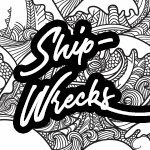 The reef is not so friendly in Monuments, the surf spot requires experience dealing with difficult conditions as each section where the wave breaks has rocks coming out the surface of the water. Your surfing skills and you would need to be in top shape, fast paddling and fast take off are not the only things needed, being able to do sharp turns in order to avoid the rocks along the way is crucial too. From the very beginning the wave is fast and takes a few attempts to adapt to it, weather you are a regular or goofy you would need to stay as close to the curl as possible in order to surf the whole wave with out any problems. When offshore comes this wave turns magical and offers small barrels, if you want to be locked in these and trim the wave perfectly you will definitely need surfing experience and a bit of luck, but that’s why we live for, right? 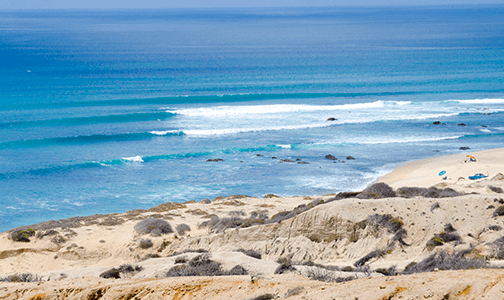 This famous winter wave in the pacific zone is only an hour drive away from San José del Cabo and Cabo San Lucas. 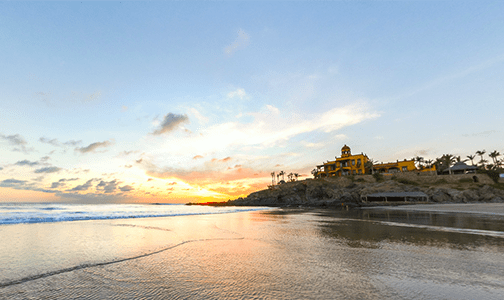 Cerritos is considered the Surf Safari experience in Los Cabos, beautiful sunrises, sunsets and whales jumping embellishing beautiful scenery will enhance a perfect winter surfing adventure. The surf spot’s wave starts breaking nicely in November and stays in good shape up to March. 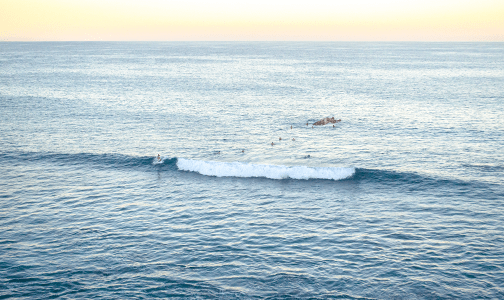 It has become very popular for winter surf lessons in Cabo because of its steadiness and playfulness, a perfect match for beginner surfers of all ages. Swells from the North activate it and as consequence the water is cold in Fall and Winter, which is why a full wetsuit is highly recommended but even a spring wetsuit will help to enjoy it for as many hours as you like. 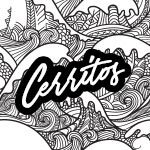 Cerritos suits all types of surfers since it possesses different points and sections appropriate for any level of surfing skills. The first section is the point break, the wave begins breaking on a boulder that due to its position creates good size waves. The impact zone varies from wave to wave and it takes a little while to figure out where to paddle to catch these bombs. The paddling and take off is smooth and slow allowing you to adjust your surfboard but once the wave starts rolling it quickly gains speed turning into a nice surfable wave you can shred. On the second section the wave touches the sandy bottom creating speed too, if you are lucky it will throw small barrels that with a good surfing level you can catch. This section can be surfed a long way down to the shore. If you do, the best way to go back out is walking along the beach avoiding unnecessary fatigue caused for paddling all the way back to the impact zone. 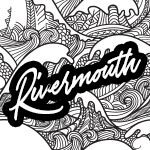 The final section is the beach break that in a good day throws very fast lefts and rights apt for intermediates and experienced surfers in good shape since they demand a lot of paddling in order to neutralize the cyclic current generated by the boulder. 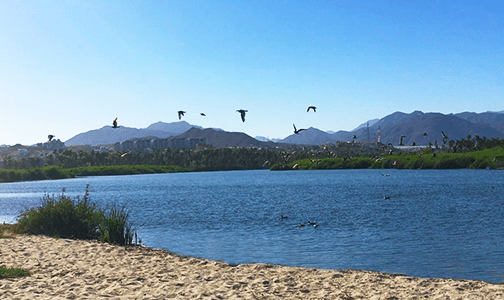 An Oasis of surf inside San José del Cabo, this beach is a jewel among other surf spots in Baja California due to its beautiful surroundings. 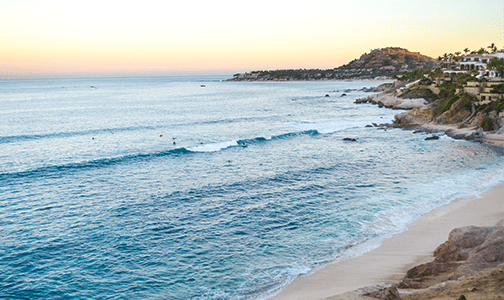 Hidden in the insides of Los Cabos, The River Mouth is a beach break that gets sand from the estuary lagoon and therefore creates an appropriate sandy bottom for some good waves. If you are visiting La Bocana don’t for get to bring mosquito repellent because the lagoon is the perfect breeding place for them. 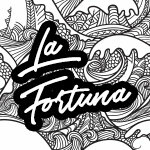 June, July and August are the best months to enjoy this surf spot that despite of being very accesible and close to the city it is very rarely visited by surfers. All the more reason to drop in and enjoy those custom made barrels for you and your friends. If you are staying in a hotel across this surf spot you will be able to hear its waves roar early in the mornings as the barrels close down and the lip hits the line and sandy bottom of the wave, after all which surfer doesn’t like the sound of a heavy wave yelling? La Bocana runs pretty well with the swells from the south and offshore wind and is considered the most powerful beach break in the area. 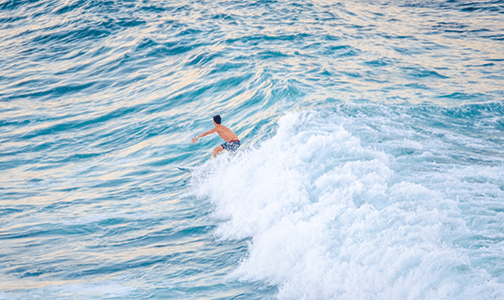 It requires an intermediate or experienced surfing level due to the wave being heavy with a fast drop. 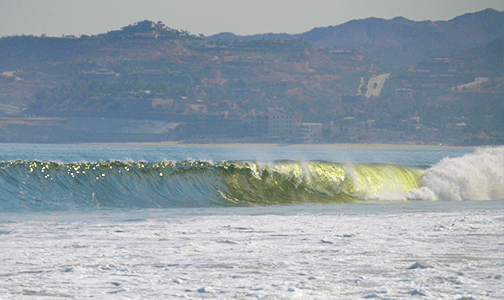 Fast paddling is needed too to catch and run the best barrels in San José del Cabo. If you are planning on surfing it the suggested surfboard would be a Gun with good volume to be able to play with the line and enjoy these rollers perfect for wide open tube lovers. 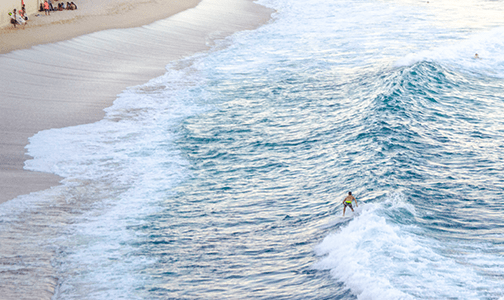 Acapulquito beach is better known by foreign people as Old Mans and is with out a question one of the most steady and easy to ride waves around San Jose del Cabo. Due to the nice swells coming into the sea of Cortez this wave runs consistently practically all Spring and Summer long (March to September), for the most part of the year water temperature is warm and pleasant but can be a bit cold at the beginning of Spring season, so a good wetsuit would be a wise choice to paddle out this spot in that time of the year. 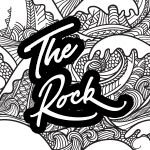 The wave consists of a rocky bottom (Reef) and begins with a friendly peak that soon finds the first rock bed that acts as a ramp causing the wave to gain some height and start breaking to the right. Its progression allows surf riders to see perfectly where it will start breaking and anticipate/paddle accordingly to catch it. Once you , the drop is one if the most friendly ones you can find in Mexico with a smooth evolution that will allow you to place your surfboard correctly and start running the wave to the right and enjoy a wave of up to 500 feet long, weather you are a regular or goofy footer you’ll be able to enjoy this surf spot like no other in San Jose. With out a question the most famous wave in the East Cape. Internationally recognized as one of the best of the whole Baja, this surf sport requires special care and attention in order to stay safe. It has special channels to go out and in that you’ll be able to know with one of our expert guides. The wave has a rocky bottom that may not be too friendly with surfers, seen from the air, the reef is a triangle shaped formation, with the base aligned with the beach and the tip of the triangle right where the wave starts to break. This is one of the most tubular and solid waves in Cabo that can reach up to 15 feet, when Spring and Summer swells arrive the best surfing sessions are early in the morning before the wind messes the fun or late in the afternoon after it’s over (the plus of an afternoon session is enjoying an amazing cabo sunset full of pastel colors). If you want to surf this wave you need to be in good shape and have a fast and consistent paddling technique because the drop on this one is fast that requires the mentioned in order to be able to accommodate your surfboard correctly and start running one of the most fun barrels in La Baja. Its name says it all, this wave breaks in a reef rock around 350 feet from the shore and is one of the fastest and more fun waves around the costa azul area staying consistent with any kind of groundswell or windswell during spring and summer. Even when the Rock is a crowded spot, both locals and non locals converge in a friendly way but if you want to avoid the crowd, it’s better to surf it early in the morning before the temperature increases. Surfing this spot is mainly for intermediates and experienced surfers because access to the beach and the impact zone is a bit tricky, finding the right channels to paddle in and out is a must to stay safe. 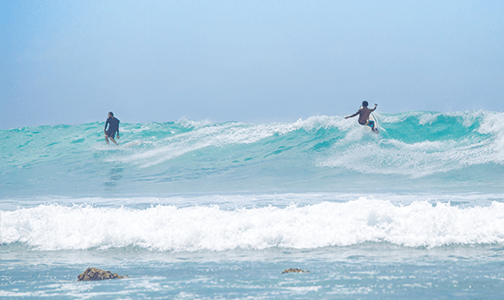 If you are unfamiliar with riding unknown waves, a surf guide would be a wise choice to enjoy this surf spot safely and show off your surfing repertoire. This wave has a fast drop that smooths out when you are correctly positioned on the impact zone (right next where the wave hits the rock and modifies the face of the wave). You would need to generate speed right away if you want to take the wave all the way down to the beach. Like all of Costa Azul surf spots, this one has a reef/rocky bottom, best practice is never getting your feet off the board to avoid any possible injuries. 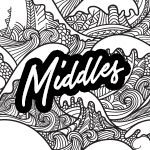 Middles is a perfect wave for beginner surfers, probably the friendliest one you can find in San José and the Los Cabos area plus it has a beautiful surrounding view of Costa Azul lands. The perfect time to surf this spot is from March to July as is when the swells come to the Cortez sea. As many other spots Middles has a rocky bottom too but you won’t have to worry too much about it, with a high tide you won’t even be able to see the rocks. Catching waves is easy in this one, you’d be able to see them coming from the right surf spot as Middles is practically an extension of The Rock and therefore share the same shore. Surfing this wave is suitable for people that is in the process of learning how to surf or people that want to surf fun and easy waves with out too much hassle. This wave is “fat” and relatively slow, consequently it can be surfed nicely with a wide surfboard or a longboard. Staying on the right of a cumulation of rocks is the right place to paddle and catch the lip of the wave. The drop is very soft and the face of the wave is small but runs for a good distance making it super fun for newbies. A good advantage of this spot is you can easily paddle to other breaks and be surfing bigger waves in no time. 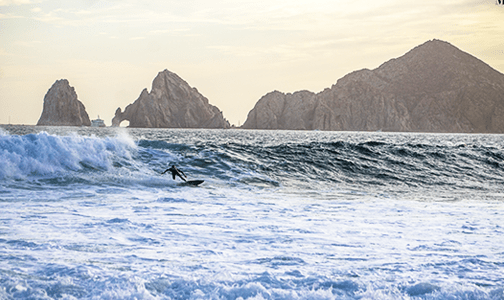 This is the most famous wave in the area, a world class wave that harbors each July an international World Surfing League event – the Los Cabos Open of Surf. For the past 5 years this event has put on the map this surf spot like no other in los Cabos. Perfect waves right outside your hotel, a good surfing session and going back to your hotel for a healthy breakfast with a great seaview. 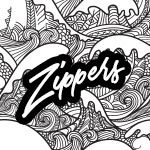 No wonder why zippers is one of the most beloved and visited surf spots in Cabo. But, as much as everyone likes it, this is the most local wave and locals may not be too friendly as they are in other surf spots so in this case it’s recommended to be accompanied with a surf guide. The wave breaks in a bed of round rocks and like most spots in Costa azul, it always breaks to the right, making it perfect for regular surfers. If you are looking for speed and power this is your wave. The spot begins with a first section where each wave is long enough to allow you to position in the perfect place where it will start breaking. Paddling quickly is essential to gain the advantage position to ride the wave. Once the wave hits the rocky bottom it creates a fast drop with some upright degree of difficulty. What makes this wave special among all the others in Los Cabos is that is very steady and uniform allowing surfers to do some radical maneuvers, it’s also apt for some air tricks on the inside of the spot (don’t forget it’s a rocky bottom so stay safe!). In the days when good swells arrive and waves are overhead or double overhead you can get tubbed in some small barrels, what more can you ask for? 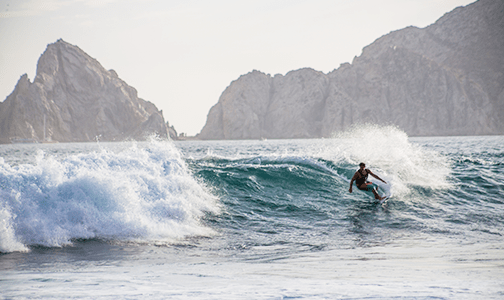 There are several other secret point breaks in Cabo and Baja California Sur, these are just some of the best spots that fit all different surf styles, so you can expect waves all year round while spending your Surf Holidays with Cabo Surfer Team. 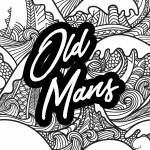 7 Days a week – we might be surfing!